Puberty, Thou Art A Heartless Beast! With that being Angelina’s first “real” illness since diagnosis, and with me suspecting that her honeymoon was drawing to a close I wasn’t sure how long after the illness was over I should expect before her basal insulin needs would go back to “normal”. I polled one of my facebook diabetes groups and most people said about 10 days to 2 weeks before things went back to normal. Well, the two week mark came and went and I was still programming Angelina for a 150% temp basal every day. My suspicion is that the illness and the added strain on what was left of her functioning beta cells pretty much killed them all. Her insulin needs have yet to go back down and over this past weekend I finally programmed in all new basal rates so I can stop doing a temp basal everyday. It seems these increased insulin needs are here to stay. In the past 3 weeks she went from an average of 15 units of insulin total over 24 hours (this includes basal insulin and bolus insulin for corrections and food coverage) to now her average being around 22 units over 24 hours and we’ve seen a couple of days where her total insulin for the day is closer to 30 units. Her total basal rates alone increased from around 5 units to 8 1/2 units per 24 hours and this isn’t even with me addressing the nighttime highs we’ve been seeing. She also is currently being insulin resistant at night time – which means she is running higher numbers and they aren’t responding well to the previous amount of correction insulin. She is relatively insulin sensitive and her night time insulin sensitivity factor (ISF) was 175 since the start of the pump in July. The ISF is the number of “points” that 1 unit of insulin is expected to drop her blood sugar. For instance, if her blood sugar target is 150 and her current blood sugar was 325, then she would need 1 unit of insulin to get her down to 150. This, of course, is not an exact science and depends on a lot of factors. The expected rate of decrease really only works if diabetes existed in a vacuum. And, well, it just doesn’t! But, with the recent insulin resistance I was seeing that 1 unit of insulin only bringing her blood sugar down 20-30 points over 2 hours or so. Which, if you understand math at all, is a BIG difference! And also means that when I would check and correct her blood sugar in the middle of the night I would expect it to come down to a lower level, but she was waking up not too much lower than she had been. With her being on a pump one of the biggest signs that something is wrong with the pump or the infusion set and tubing is high numbers that don’t respond to correction insulin. In this case you are supposed to either chance the infusion set and/or give correction insulin through a shot to rule out a pump problem. If the person responds well to correction insulin by shot, then chances are there is something wrong with the pump/infusion set. If even a shot doesn’t bring the blood sugars down, then the options are either the insulin is bad or not working properly, or the person is being insulin resistant. In Angelina’s case, her blood sugar levels were more normal during the day and it was only at night that she was not responding well to the insulin that was coming from her pump, which helped to rule out a pump or insulin problem. Puberty is a typically difficult time for any child (and parent) but this is doubly so for kids with Type 1 Diabetes. The excess hormones cause the insulin to be less effective, resulting in higher insulin needs, sometimes with less than stellar blood sugar results. Pair that with kids who are moody or trying to become more independent of their parents and don’t monitor themselves as closely as their parents did. Being hungry and wanting to eat all the time because they’re growing. Choosing less healthy convenience foods on the go. And it’s a recipe for quite a lot of extra insulin needed. It’s not uncommon for kids going through puberty to need much more insulin than an adult with type 1 diabetes. So, how does a parent handle this? By not sleeping. I’m serious. Sort of. Since Angelina’s insulin needs never came back down after her cold I have been doing more night time monitoring. This wouldn’t be such an issue, and is pretty common for any d-parent, except that when I sleep there is no waking me. Occasionally my 2 am alarm might wake me up, but most of the time if I am out- I’m out till morning. Which means that I have been spending more time up late at night, often not going to bed until after 2am when I check her to make sure her blood sugar isn’t too high. And then, I get up at 7 or so to get her off to school. Thankfully, I’m a non-employed type person so depending on what’s going on that day I get to take a nap for a little bit while she’s at school. It’s still not the same as getting a solid 8 hours of sleep at night though. It’s been a while since I’ve posted any personal updates so here’s the last month in a nutshell: Received Angelina’s new CGM transmitter with enlite sensors on Halloween! I was told we should hear from our trainer within 7-10 days but I am impatient so I sent our trainer an email and said “We want to start ASAP. Give me a time and place and we’ll be there!” (Okay, I’m paraphrasing, but you get the idea). She emailed me back later that day and said she would be at the clinic the following Tuesday (4 days later) and she had an hour she could squeeze us in. Meanwhile, that same Friday: Angelina came down with her first cold since she was diagnosed with Type 1 in March. She didn’t have school due to a teacher work day and she was fine in the morning. Around noon I decided to head to Target to hit up their Halloween clearance (which was sadly disappointing). She sneezed twice in the car and I just figured it was her allergies. We stopped and grabbed a quick lunch at the Target Cafe before shopping. She started having a little cough while we were eating and about halfway through her sandwich she said “I’m not really hungry anymore.” Uh oh! That meant she got to drink real fully sugared soda because a Target Cafe sandwich is not low carb and there was no way she could skip out on not making up some carbs without dropping low. And, no, I don’t mean her dance moves. By the time we got back to the Halloween section she was coughing pretty regularly and kept sneezing and had a runny nose and was just all around feeling pretty terrible. She seriously went from being perfectly fine to full-blown “I feel (and look) like Death warmed over” sickness in less than 30 minutes. Fortunately the Halloween clearance was pretty bare and incredibly disappointing (did I mention this?) and we were in and out of there pretty quickly. Took her home and made her some tea and she spent the rest of the afternoon on the sofa watching TV and burying herself in used tissues. As the night wore on I started noticing her blood sugar levels slowly creeping up and up and decided it was time to program in a temp basal. For those of you not insulin pump savvy – a temp basal is a setting on the pump where you can temporarily increase the basal (or background) insulin for up to 24 hours at a time. We have ours set in percentages, so for instance: I set a 120% temp basal which means she was getting 20% extra basal insulin for the amount of time I had set. Numbers were still creeping though so I gave some correction insulin and changed the temp basal percentage up to 140%. She seemed to do okay with that amount until late Saturday and I cranked it up to 150% (so, again, this means she’s getting an extra 50% more basal insulin than usual). She was still running fairly high, but it was night time and I was afraid to push it up any more and it maybe be too much, so I jut did correction insulin every once in a while, as needed. She also has asthma so any kind of cold almost always ends up in her chest and results in much more albuterol inhaler usage. Which also can sometimes contribute to higher blood sugars. Not to mention all the extra stress struggling to breath puts on her body. Fortunately by Monday she was starting to get better but still needed a lot of extra insulin and blood sugars were running in the 200-300’s with a few spikes into the 400’s. Remember, her “normal” range is supposed to be 100-150. We checked for ketones a couple of time a day and thankfully she never had even a trace of ketones. I did learn though that we need a bigger prescription for ketone test strips! We use a blood ketone meter and the strips are pretty expensive – about $60 for a box of 10 strips without insurance. We are fortunate that our insurance does cover them but we still have a $30 copay for up to 10 boxes at a time and we went through an entire box in the 4 days she was sick. Her current RX is just for 1 box a month, so with cold and flu season here and her propensity for catching everything that goes around we will be asking for the endo to write for at least 2-3 boxes a month for the next few months, at least. Tuesday she was probably better enough to go back to school but she still had a slight cough and I was going to have to pull her out around 11:30 anyway to go to the CGM training so we just let her stay home. David called out of work that day too so he could also attend training and we just had a sort of laid back day. We ended up going to the movies and out for ice cream after training. It was interesting to watch the popcorn and ice cream in real time on her CGM. It was also blaringly obvious that we have been missing a LOT when it comes to the fluctuations in her blood sugar levels. Then, on Thursday, I got hit with the cold Angelina had just gotten over. Luckily for David, he never caught it from either of us. Welcome to National Diabetes Awareness Month! As a nice kickoff for #NDAM (National Diabetes Awareness Month) I decided to share our day with the Twitterverse and Facebook through my twitter account: @ChasingLows and facebook page: Chasing Lows. This was a total rip off of the T1D4ADay awareness campaign that I blogged about in an earlier post that is being sponsored by JDRF and Lilly Diabetes. I just thought it would be cool to add our voice and experience to the cause to bring awareness to how Type 1 Diabetes effects us on a personal level on a daily basis. 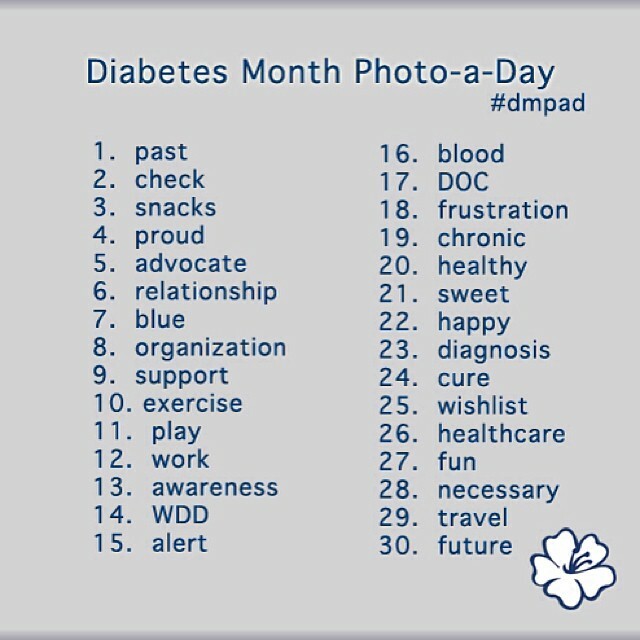 In addition to my own T1DPARENT4ADay campaign (haha) I am also planning on participating in the Diabetes Awareness Month Photo A Day challenge and will be attempting to throw up a photo each day. This will be more likely to happen through Twitter or my facebook page, so be sure to check in at the links I added above! Since I am here though, right now, here is the challenge: I think this particular list was “borrowed” from Kerri over at Six Until Me, but I got it from Katy at Bigfoot Child Have Diabetes. For Day 1 here is a “Past” picture: This was Angelina practicing her “scary” persona in preparation for being a vampire princess for Halloween. 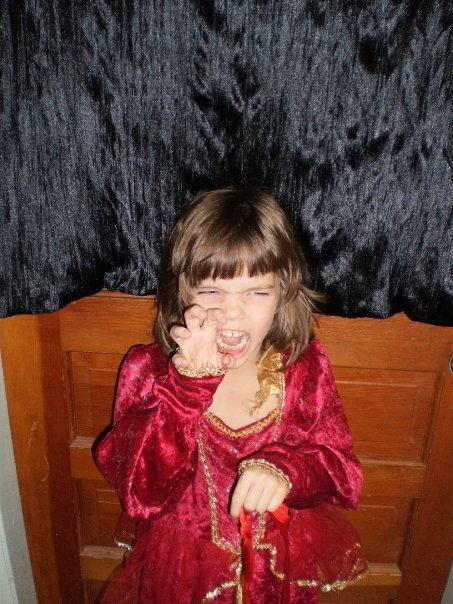 This was from Halloween 2009, so she was 6 years old.